On a beautiful Autumn morning, MC Property Maintenance are on the home straight to completing this project in Bognor Regis, West Sussex. Over the summer we have been restoring this property on Bognor seafront to its former glory. 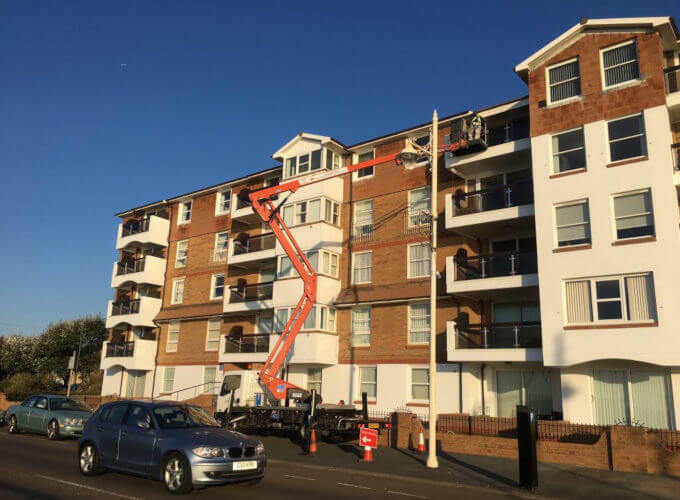 With the help of our workhorse the CTE Zed 21JH truck mounted cherry picker we have been able to carry out remedial repairs and redecorate this building and let the resudents enjoy their view over Bognor seafront and promenade. When combining working at height and access platforms you can’t get much better than the CTE Zed 21JH cherry picker, with its easy to use controls and a weight load of up to 300Kg in the cage, its gives the opportunity to get a variety of jobs done in quick time. Whether you are decorating, roof cleaning or repairing and clearing the gutters, this cherry picker gives you an affordable option to scaffolding. If you have a project that requires you to work at height, before you pay out for costly and unneccessary scaffolding. Why not contact us on 01243 530076 to discuss other options and prices.